A year ago I made a resolution. 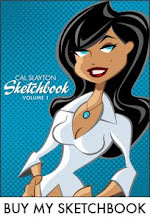 It was to work on Spookytown everyday in 2009. No matter how small. 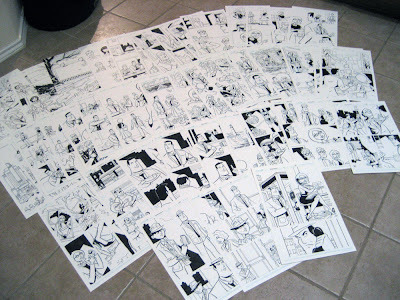 Even if it was just drawing a face, as long as I did something each day to advance the book closer to being done. 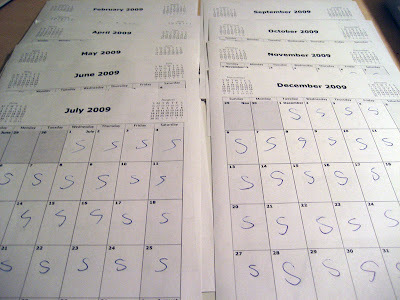 I even printed out monthly calenders to mark my progress. Well, I think I did pretty good. I had 5 pages done a year ago and now I have 45 pages completed. I failed on 14 days throughout the year. Most of those days I just got too busy with other things (work, freelance, being a dad, being a husband) and forgot to get to it. A few of them I might have actually been sick though. I did allow myself a break when I went on vacation, so those days aren't in there. I figured I deserved them with all the work I do. I'm not doing it again this year, officially at least. But I will attempt to finish the book this year. Just 25 more pages to draw. Then scanning them, coloring them and lettering them. One thing I've already done is set up all the lettering into separate Illustrator files. Each piece of dialogue is broken out, I just need to create the speech balloons and put them in place. So, I think it was a successful resolution. 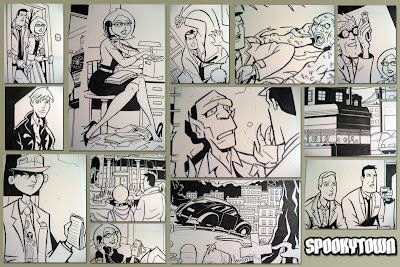 Here is a sneak peek at some miscellaneous panels form the book. That's good to hear, Cal! From what I can see, it looks like it will be a fun book to read. Have a happy new year, and here's hoping you'll be finished and have it published by the end of 2010! Thanks. Looking forward to seeing your pin-up! Let me know what I can draw for you.